Jete's Trucking specializes in the movement of finished forest products and intermodal containers. Our established links with marine and rail terminals, coupled with ongoing communication with our drivers, ensure that our customers will experience "no surprises." With the utilization of technological improvements, within the transportation industry, this has given us the ability to provide our customer with up to the minute information regarding the status of their shipments, to ensure safe and prompt delivery. Jete's Trucking takes pride in its fleet, by constantly maintaining our up-to-date equipment we ensure we are always able to meet our customer's needs. We are proud to be C-TPAT members. 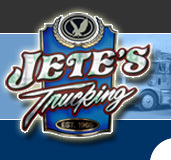 Together with our established reputation and the use of technological improvements, Jete's Trucking is setting the industry standard.